The Catholic Pontiff, Pope Francis has declared Mother Teresa a saint at a canonisation mass held in St Peter's square, Vatican City in Rome, reports ITRealms. "For the honour of the Blessed Trinity... we declare and define Blessed Teresa of Calcutta (Kolkata) to be a Saint and we enroll her among the Saints, decreeing that she is to be venerated as such by the whole Church," the pontiff was quoted as saying in Latin. 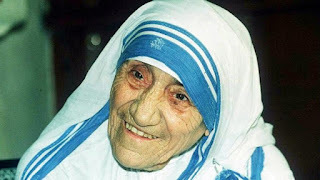 ITRealms also reports that the promotion of one of the icons of 20th Century Christianity, Mother Teresa to a saint, came a day before the 19th anniversary of her death the Indian city, now known as Kolkata, where she spent estimated four decades working with the dying and the destitute. ITRealms equally gathered that over 100,000 pilgrims attended the service, just as Mother Teresa is now to be known and referred to as St Teresa of Calcutta. Thousands attended a papal audience on Saturday in the Vatican, where a large canvas of the late nun in her blue-hemmed white robes hung from St Peter's basilica.